What are the colours of Eton Wick? Amber and black are the colours of Eton Wick Football Club and have been for well over 100 years. It has also been the sports colours of the village primary school. When a junior football team was started in 1947 they played in white and black. This was a result of clothing and many other everyday items being on ration. The years immediate after the end of the Second World War were a period of harsh austerity both financially and materially. Frank Bond recalls cycling around West London with a friend in a vain search for army surplus football kit. It was decided that a white, or very pale shirt was the most commonly available among the boys and black out material which was off ration was used to make the shorts. In the early years of the 20th century the Eton Wick Football team was known as the wasps because of the black and amber strip they played in. The Boy Scout Troop also chose black and white for the colours of the scarfs in the early 1930’s. The design of the masthead at the top of our website were chosen specifically to reflect the colours that have represented the Village for so long. If you know of the colours that any of the other village organizations or groups used that were unique/specific to them please do let us know by using the comment box below. 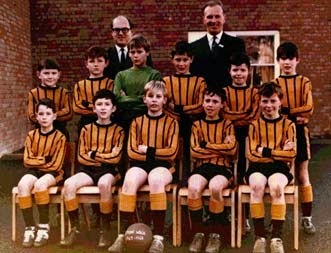 The photograph of Eton Wick Primary School football team was provided by Martin Deebank.